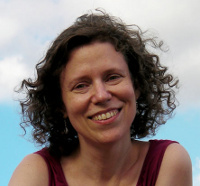 Nina Paley is the author of the freely licensed hit animated film Sita Sings the Blues, a longtime veteran of syndicated comic strips — "Fluff" (Universal Press Syndicate), "The Hots" (King Features), and her own alternative weekly "Nina's Adventures" — and a committed Free Culture activist. She teaches at Parsons School of Design in Manhattan and is a 2006 Guggenheim Fellow. Since 2009 she has been Artist in Residence at QuestionCopyright.org, where she is currently working on Minute Memes and the Sita Distribution Project, among other things. She is a 2010 winner of an "IP3" award from Public Knowledge.